We’ll get to the zombies in a minute, but first some background. 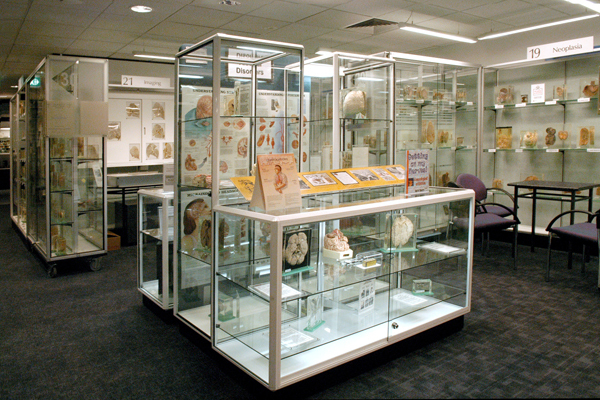 The University of NSW is home to the Museum of Human Disease which is a museum that proudly earns its place on the list of the 10 weirdest museums in the World. Imagine rooms with walls lined with shelves and on those shelves are carefully preserved human organs, diseased human organs. A visit is, it must be said, a bit confronting: The combination of being surrounded by so many bits of dead people, some of which are obscure internal organs but many are readily recognisable as a foot or a finger, and seeing so many diseases leaves you both a bit creeped out and with a mildly distressing sense of your own mortality. I defy any thinking person to run off and have a drink after seeing a liver suffering from cirrhosis, or to be blasé about smallpox after seeing an infected limb. But I don’t want to leave you with the impression that the Museum is all about gazing at bits of dead people. Quite the opposite. First, if you steel yourself, the exhibits are fascinating. More importantly, the staff make the whole place absolutely brilliant. At the moment the educational theme is zombies and visitors can work their way through a series of puzzles identifying various diseases and working out who the zombie is from a list of candidates. It’s a great way to introduce students to diseases and diagnosis. For further interactivity you can do a dissection. We’ve done things like this in several museums around the world, but this was far and away the best. It was an absolutely brilliant combination of the fascinating and the educational. The patient and knowledgeable teacher took a wide range of kids through dissecting a heart and a brain (sheep not human) – which was interesting and completely pertinent in the context of the Museum. On our visit there were about 10 kids ranging from 6-13 also visiting and while they occasionally evinced some squeamishness, there’s no question they all learnt a lot. If there’s one thing I’d like to see done differently in the Museum, it would be that they put some healthy organs side-by-side with the unhealthy ones. For a lay-person, it’s difficult to appreciate the ravages of the various diseases on the organs displayed when you don’t have a comparison point. Apparently there is a room full of healthy organs elsewhere in the University, but it’s not open to the public; so maybe even some comparison photos would help. I highly recommend the Museum of Human Disease if you want to see something a little (OK, a lot) different. The zombie theme runs for a while yet; and is then being replaced by cyborgs for which the clever Museum education team have some wonderful plans. The museum of human disease is unusual, earning it the 9th spot in the world’s weirdest museums. But on top of that, it is cool. It features hundreds of diseased organs which are amazing to look at in disgust. They’re harsh and ugly, but also awesome to see and give you a sense of what diseases are actually like. Though that is the main part of the museum, there is also the hunt to find the cases of disease. Basically, there are some captives, each with different diseases and one of them is a zombie. You have to find out who the zombie is and also what the others have caught. Once you have figured it out, you can check on a computer to see if you’ve been succesful. Then you get to dissection. First you get a sheep’s heart to dissect, and you find out a lot about the heart and all its different sections. Actually cutting up a heart there makes the experience of learning about it much more real, and you can even pump it with your hands. It is simply a great way of learning about the heart. Then you take a sheep’s brain and dissect that (because…. zombies). It is squishy and easy to break but it gives you a better picture of what brains actually look like. Of all the museums we have been to with dissection experiences, The Exploratorium and The Smithsonian to name two, this was by far the best dissection we have ever done. I love this museum and definitely recommend it to everyone who gets the chance to come for an hour or two.